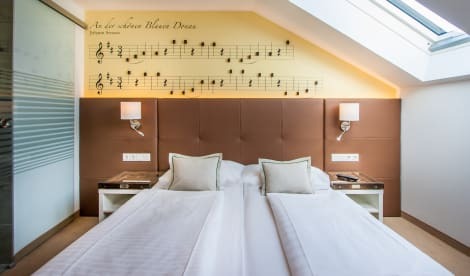 This comfortable city hotel is located in Vienna's Alsergrund district just a short walk from the Ringstrasse. Sightseers might explore the city on foot, as the celebrated MuseumsQuartier is within walking distance, and the iconic Hofburg Palace is 20 minutes away. Guests might also take a pleasant stroll past Sigmund Freud Park to arrive to Schottentor metro station, only 650 metres from the hotel. The hotel's guest rooms are bright and cosy with views of the quiet courtyard or bustling street. Rooms that overlook the street are equipped with soundproofing to ensure a good night's rest, and guests can take advantage of the free in-room Wi-Fi to keep in touch with home or office. Each morning a healthy continental breakfast is served in the breakfast room and the helpful and friendly hotel staff is delighted to advise guests of the best places to visit and dine in this enchanting city. Buffet breakfasts are served on weekdays from 7 AM to 10:30 AM for a fee.